Until now, Tesla offered its customers two home charging options — the Gen 2 Mobile Connector that comes standard with all new Teslas or a hard-wired wall-mounted charger. 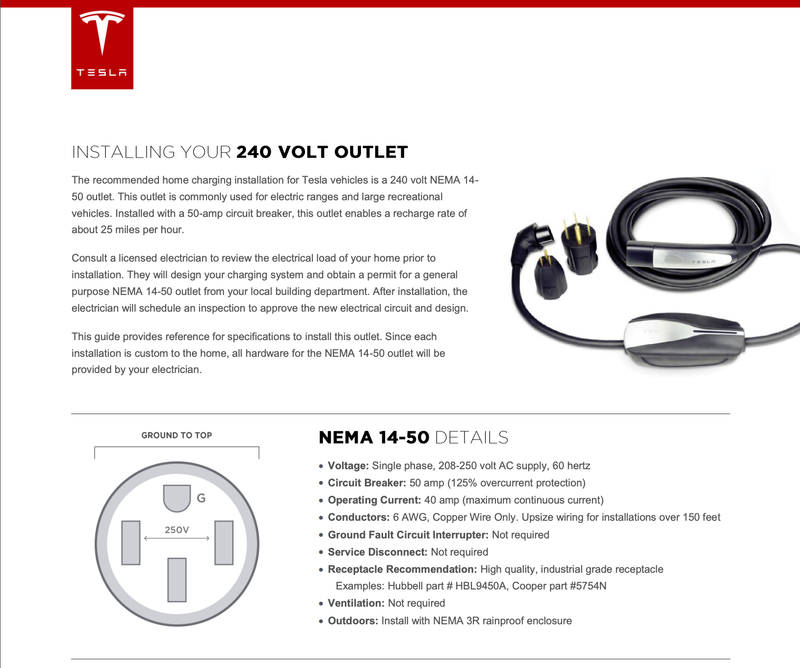 Now it is offering Tesla owners a third option — a new Wall Connector that can be plugged into a standard NEMA 14–50 receptacle commonly used for electric stoves. Why is that news? The Gen 2 Mobile Connector also plugs into a NEMA 14-50 receptacle, but it has a maximum power of 32 amps. The Wall Connector has a maximum power of 40 amps, which means it can charge a car 25% faster — about 25 miles of range for every hour of charging. It comes with a 24 foot long cord, and when you leave home, you can unplug it and take it with you. Both units are available from Tesla at a cost of $500. The hard-wired wall charger is capable of higher power charging, but can’t be disconnected and taken along when you leave your garage for distant destinations. Faster charging than the Gen 2 Mobile Connector but less money than a hard-wired connection, the Wall Connector will be the right charging solution for many Tesla owners. Portability is just icing on the cake. It is available from Tesla now in any color, as long as that color is silver and black. Like all Tesla products, the new Wall Connector is the beneficiary of sleek, contemporary styling. It looks at first glance like a miniature version of the original Powerwall residential storage battery. Not all charging equipment is as stylish. Once again, Tesla is out ahead and leading the way in the electric car revolution.